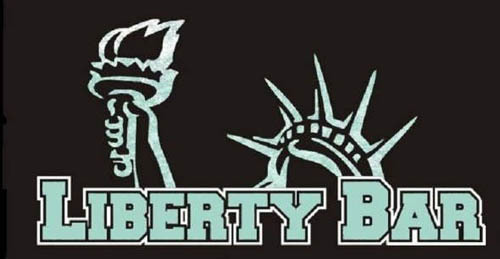 Liberty Bar is gutsy enough to call itself "The Only Real Bar in Pontiac." We've got a lot of favorites in town, so we won't go quite so far as to agree with that, but we will agree that it's one of the very best! You simply cannot beat the atmosphere here. With the warm and subdued lighting in shades of yellow, orange, pink, and purple, contrasting dramatically with the shadows and the dark decor, you will feel like you've stepped right into another world. They've got over fifty beers in bottles here and a very large list of wines. You'll enjoy Happy Hour on weekdays until 7:00 PM, on Fridays until 9:00 PM, and on Saturdays until 6:00 PM. They're open every night until 2:00 AM except Sundays when they're closed. Now let's talk about the food, because it deserves its own feature. This is not bar fare at all. This is top notch restaurant cuisine at its best. They've got great hot and cold tapas including chevre, sauteed andouille, and an imported olive plate that will make your mouth water. They've got a great selection of salads including a Cobb Salad and a Cucumber Salad that we are nothing short of addicted to. Their paninis and sandwiches are equally good, especially the Roast Beef & Gouda, and the Turkey Asiago! They've also got great entrees, burgers, and both fryer and deli favorites. This paragraph can't even come close to describing the greatness that is Liberty Bar's food! We highly recommend this place. Located on Saginaw Street right in the middle of it all!